‘A funny and frank superhero story set in the world of Othergirl. Poor Wilco has his nickname because he ‘will comply’, i.e. will do people’s homework for them and almost anything else for a quiet life. He has one friend and many enemies amongst the ‘rugger boys’, who despise everyone. The book gets off to a good start when Wilco first senses that he may have special powers. It’s pretty weird to find that by concentrating on an object you can move it at will. He hopes that this will change his life, help his hardworking mum (who can barely afford his school uniform) and perhaps even turn him into a Vigil. These Vigils are people with superpowers who are believed to help the government, save lives and generally whiz about to do good. Alas for Wilco. Nothing is that simple and using his powers leads to nothing but trouble. I found the book went off the boil for a while until Wilco accidentally manages to do something really useful (and unlikely). There’s no dramatic improvement in his life at Gatford House (which sounds a horrible school) but the future looks more hopeful. I didn’t find Wilco a well realised character and couldn’t help thinking of Molesworth (whom one believes in totally) and the way he copes with ‘swots, bulies, cissies, milksops, greedy guts and oiks’. It’s a sad truth that bullying is rife in schools (and in the workplace) and that victims will not develop superpowers in order to cope with it. So I’m underwhelmed by Wonderboy. It’s not quite fantasy yet not helpful about coping with what life throws at you when you happen to be a weedy teenager. I’m at a loss to know why this book is described as ‘frank’. Frank about what? The fact that quite young boys and girls fancy each other? That’s news. I’d have enjoyed this book more if I were a ten year old boy, I think. 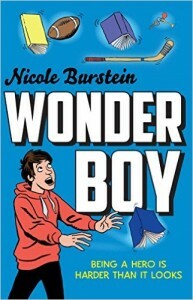 Wonderboy is out early next month and I read it courtesy of NetGalley.